Ba Health Sciences (Nursing), Master of Public Health – Aeromedical Retrieval, Grad Dip Health Science (Advanced Nursing Practice),Grad Cert. (Child and Family health), Grad Cert. (Orthopaedic and Trauma nursing), Certificate IV in Assessment and Workplace Training, RIPEN and IPN. Louise first become interested and involved in Aeromedical Retrievals as a Grad nurse in Darwin, where trauma patients were frequently transferred using commercial aircraft. Almost 30 years years later, she has now worked in various roles within emergency and critical care areas at the Royal Darwin, Austin Hospital, Melbourne, Chester (UK), Toowoomba Base and Royal North Shore, Sydney. 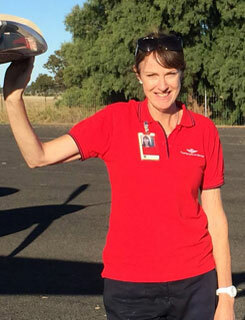 Louise has over 18 years experience as a Flight Nurse, having held a number of Flight Nursing roles doing primary health and aeromedical transport at the Mount Isa and Cairns Bases and now Brisbane Base RFDS. She has worked as a single RAN in very remote Qld, done volunteer work in Zaire (Africa) and has worked at every QLD RFDS Base including a month in Alice Springs. In the last 12 years, she has held a number of senior positions and currently is working in two roles as a Nursing Educator and Nurse Manager/Nursing Resources. She is keen to see FNA develop and grow and passionate about promoting Flight Nursing as an amazing and varied career. When she is not at work, Louise loves traveling, cooking and is learning how to renovate a house.